Stand-up sketch comedy from an aspiring actor robot! The first-ever live guerrilla performance was in Washington Square Park in Manhattan on Friday August 9, 2010! 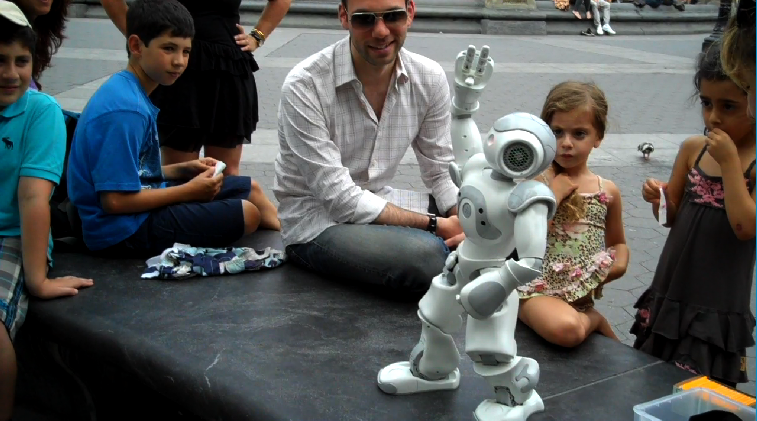 The ‘Postcards from New York’ sketches use the Nao robot of Aldebaran Robotics, which is 23 inches tall, humanoid, and widely used as a robotic platform in academic research today. The audience directs and affects this somewhat self-indulgent robot’s performance, selecting among New York ‘postcard’ neighborhoods and stereotypes as he uses his sensors to pull you in. Next up: Nao @ World Makerfaire, taking place in NYC September 25-6. Its expressiveness and interaction capabilities will iterate based on viewer feedback and reactions. 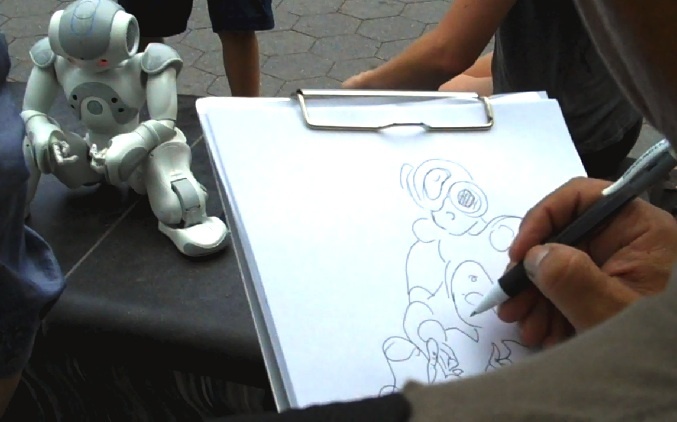 The park was a special setting - the robot was popular with all ages, most of whom had never interacted with a robot before, and there was even a local artist who decided to sketch the performer’s likeness. This robot-in-the-wild may be an aspiring actor, but it will analyze your feedback (without self-loathing) for future performances using rubrics currently in development (see publications page for the latest details on that). Viewers were requested to fill out paper surveys after the initial performance. We are also developing applause analysis for our next iteration, and may also explore laughter, gaze, expression, posture and physiological sensors as the project develops. The goals? Develop more effective personalities for everyday human robot interaction, help machines understand charisma and humor, and explore the applications and impact of having friendly robots in everyday settings. Putting the robot ‘in-the-wild’ also invites the general public to teach robots in natural and often playful social settings. First episode developed with Guy Hoffman, special thanks also to Aldebaran Robotics.